The decorative arts in Islam are marked by a remarkable degree of stylistic consistency which has been applied to a broad range of materials, each of which had a craft-base of its own, the history of which often traces back to pre-Islamic times. The stylistic coherence within the Islamic world and the many variations of its basic themes across time, influenced as they were by local artistic traditions, are all part of the fascination of this art. In Muslim architecture virtually any surface may be regarded as worthy of receiving elaborate decoration and this is particularly apparent in religious architecture, but this principle extends out to woodwork, ceramics, textiles, metalwork, books and many other art forms. There is an East–West divide in basic Islamic architectural techniques that derives from earlier, pre-Islamic traditions. In the Persian/Iranian sphere of influence the principle building material tends to be brick, whereas in Egypt, Syria and Asia Minor, stone is far more common, at least for monumental building. The earliest Islamic monuments, dating from the Umayyad period, clearly continue the Roman/Byzantine tradition in their typical structures and in their use of dressed and carved stone. These techniques continued under later dynasties in Egypt and Syria (the Fatimids, Zangids, Ayyubids and Mamelukes). This architecture is characterised by its monumental scale, its relative simplicity of form and a somewhat sombre tone. The deep carving, ordered in panelled schemes, with calligraphic bands and geometrical and arabesque motifs, make an impressive contrast against great expanses of undecorated surfaces. In Asia Minor the Seljuks, and later the Ottomans, continued the traditions both of ashlar building and of stone carving. Under the Seljuks a more plastic style of stone-carving was introduced, based on the stucco work of their predecessors in Iran. This gave rise to a rich tradition of that used all the familiar elements of Islamic decoration in a dazzling profusion of examples. The strength and vitality of this tradition of carved stonework continued up to the beginning of the 16th/10th century, gradually becoming less exuberant during the Ottoman period. A separate tradition of architectural stonework developed on the Indian sub-continent, again derived from pre-Islamic sources. The early Turkish conquerors of India introduced entirely new, and in many ways quite opposite, architectural concepts to the sub-continent, but the synthesis that arose from the meeting of Hindu and Islamic traditions produced a great range of marvellous buildings, and countless examples of exquisite carved and inlaid stone decoration. As mentioned above, brickwork was the favoured building technique in the eastern Islamic provinces of Iraq and Iran, the tradition originating in the ancient civilisations of this area. Typically, however, in the hands of Muslim builders, brickwork was soon being used in quite novel and more decorative ways than in the past. In fact there is a well-defined progression in the use of brick in eastern Islam, from purely structural purposes towards ever greater decorative complexity. The first stage (in the 11th/5thcentury) saw an increasing variety of brick bonds that created relief patterns of light and shade to great effect. The enthusiasm for this technique was such that some buildings featured dozens of different bond-patterns, veritable showcases of brick design. Later, carved ornamental inserts were used to break up the tedium of plain bonding; these were soon moulded before being fired, in a whole variety of motifs. In the next stage these brick inserts were glazed, a technique that lead naturally on to entire walls and domes being invested with coloured glazed bricks, by which time the structural and decorative functions of brickwork had more or less separated out. Over time these glazed bricks were gradually reduced in thickness until they were virtually tiles – and the possibility of a whole new era of architectural ornament was created. Coloured glaze was part of the repertoire of decoration in the architecture of the Ancient middle-east, in both Egypt and Mesopotamia – by the time Islam arrived on the scene however, these techniques had been long forgotten. The earliest Islamic monuments made extensive use of mosaic as both floor and wall decoration, but these were very much in the still-flourishing tradition of late-Antiquity. It was not really until the 12th/6thcentury that architectural ceramics began to be used extensively in an Islamic setting (by way of the progression described above). The gradual development of suitable ceramic glazes, in both pottery and tile-work, represented a whole series of technological advances, and as such was as much a scientific/technological achievement as an artistic one. The enthusiasm for the intense colours produced by these techniques meant that they were eventually transmitted right across the Islamic world, from the Atlantic to Central Asia. Ceramic tiles are found in most Muslim countries, using an extensive range of techniques that include high moulded relief, polychrome, lustre-ware and sgraffito. In addition, sophisticated techniques were developed that used pieces of cut-tiles, bonded together with plaster, to form elaborate, multi-coloured mosaic panels. The latter method was particularly favoured in the lands that came under Timurid influence (Iran and Transoxiana), and in the Islamic far-West (Spain and Morocco). The broad area that fell under Iranian influence had a long, independent tradition of ceramic architectural revetment, known as kashi, which reached its first great achievement in the 14th/8thcentury and was sustained through the Timurid and Safavid periods. 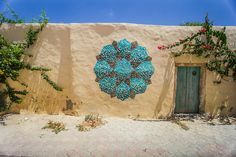 Each element of the traditional Islamic decorative canon, geometric and vegetal arabesque forms, together with calligraphy, is used but with great local variations of style. The use of cut-tile mosaic seems to have come into favour in the Islamic West (the Maghreb) with the appearance of the Berber dynasties in the 12th-13th centuries (6th-7th). Known as zellij, it is almost exclusively dedicated to geometrical arrangements in this part of the world. 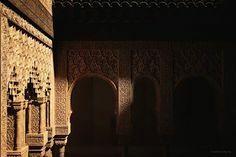 The Maghreb (Spain and Morocco) had long followed an independent cultural existence, developing its own characteristic architectural and decorative forms. The particular specialty here was always an intense geometric patterning, a tradition that has lasted right up to the modern period. Plaster was a well-established building material prior to the Islamic conquests both in Iran, where it had been used to cover rough, rubble walls for centuries, and to a lesser extent in the Classical, Mediterranean world. This was a readily available material in the Middle-east, and was used in Islamic architecture from the very earliest periods (in Syria and Iraq), from where it fairly rapidly spread to the rest of the Muslim world. Its earlier forms followed late-Classical and Sassanian models, but Islamic tastes were soon asserted, inclining towards a flattening of the decorated surface, the emphasis on symmetry, its division into distinct, evenly laid-out panels, and the use of abstract rather than naturalistic motifs. Plaster, a singularly useful material that leant itself to moulding and carving in a variety of ways, became a staple of Islamic architecture. Perhaps because of its plasticity as a medium it was less frequently used for purely geometric designs, and was more often used in vegetal-arabesque arrangements. It could also, of course, be painted or gilded. In essence, plaster (on its own or in conjunction with ceramics) was the perfect medium for transforming surfaces – which was always the primary concern in Islamic architecture. 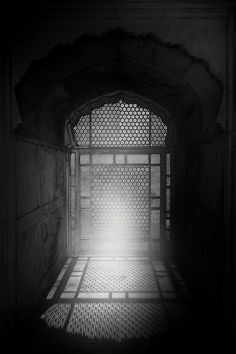 In Islamic art generally, the underlying intention is bound up with the notion of the dissolution of matter, of transcendence. Since wood is a comparatively scarce material in many parts of the Islamic world it perhaps not surprising that it enjoyed a higher status as a material than elsewhere and, at its best, displays the very highest levels of workmanship. Traditionally, it was used for doors and window shutters which are frequently inlaid, but the finest work is generally found on pulpits (minbar), the key piece of furniture in the mosque from which Friday sermons are preached. Many highly sophisticated techniques were developed to create intricate decoration; in the finer examples ebony and other precious woods are used as inlays, together with ivory and mother-of-pearl. The carving in these objects often has a concentrated, almost lapidary detail. In the Islamic world the skills of carpentry were traditionally associated with geometry. The 14th/8th century historian Ibn Khuldun (who was presumably expressing a generally held belief) asserted that all the leading Greek geometricians were masters of this craft. Some surviving examples of 12th/6th century woodwork indicate that the genre of complex, interlacing geometrical designs in the girih mode were relatively common by this time, and may have been expressed in this architectural medium before any other (after their probable invention as Qur’anic illumination in the 10th/4th century; see below). As indicated above, the earliest appearances of the girih mode (the classical Islamic decorative style that includes both geometric and vegetal forms) are found in late 10th/4thcentury Qur’an manuscripts that are believed to have originated in Baghdad. It is thought likely that this style spread out to other mediums from this source. Although the precise mechanisms by which this style was transmitted are obscure, obviously it would have been facilitated by the widespread availability of paper soon after this time. The three components of the Islamic decorative canon (calligraphy, of course, geometrical and vegetal arabesque arrangements) which were established in this medium continued to be a feature of the Islamic arts of the book, with every period making its own contribution to the genre. As the most elevated of all objects the Qur’an naturally always received the most respectful and inspired treatment, but there are also many examples of geometrical patterning and arabesque in secular book illustration. Clearly, the art of decoration was taken seriously in Islamic culture; patterns had a currency. Their appearance in the portable arts i.e. of the book, in craft-albums and working drawings, meant that existing examples could be reworked and improved upon, and those who specialised in decorative patterns could inspire new directions in this way. There are countless examples of intricate pattern in each of the major traditions of miniature painting (Turkish, Persian and Mughal Indian, in fact sometimes they are positively teeming with them. The exploration and playing with decorative ideas that is evident in so many of these works is probably indicative of a general interest in the subject in studios of various kinds. Sadly, apart from these examples and the few surviving folios and working drawings, the originators of the majority of these brilliant patterns and arabesques are likely to remain obscure. The distinction between the artistic and luxury goods that were commissioned and made in centralised, Royal studios and workshops, and those that were essentially the products of small-scale cottage industry, has already been remarked upon. This division, however, between central and independent manufacture in traditional Islamic cultures, was often a rather more complex business than this simple apportioning might suggest. It was usually the case that Rulers and their court custodians were the chief arbiters of taste and fashion in all things, but in most periods there were thriving manufacturing centres of such goods as textiles, pottery, metalwork and glassware, with their own design traditions. Many fine articles were designed in Royal studios and manufactured in Royal workshops exclusively for use by the Court, and occasionally these productions were made available to other wealthy clients. In other cases designs were created in an official studio and the work then commissioned from independent artisans, many of whom worked in districts close to Royal palaces. Religious institutions were of course another major source of commissions. These differences of origination, together with differences in local tastes and traditions, account for the greater variation of design in the arts of ‘everyday objects’, by comparison with the consistencies of the formal decorative modes in architecture. Symmetry, as always in Islamic design, was still the keynote, but the traditional decorative canon (of geometrical patterns, arabesque arrangements and calligraphy), while an ever-present and general influence on design, exerted less of a hold beyond architecture. The design studios retained by Islamic ruling houses tended to exercise stylistic control and consistency across a whole range of mediums, including architectural decoration. In many case this stylistic continuity is fairly evident – the designs on Nasrid silks, for instance, have clear similarities with contemporary stuccowork. Textiles, partly because of the important role they played in courtly life and ceremonial, were frequently a focus for court designers and textile workshops themselves were actively encouraged by the ruling establishment in many periods. There are abundant examples of this sort of stylistic conformity across the arts in the Ottoman, Safavid and Mughal dynasties, and it is safe to assume that this was the case in earlier periods. There is evidence from various Islamic periods of complex designs being prepared in design-studios and passed on to skilled artisans across a range of luxury items, including (at different times), metalwork, carpets, glasswork and ivory-carving. In fact a great many artistic products from the Islamic world, in all mediums, are characterised by highly organised arrangements with complex schemes of patterning that clearly indicate a prior design stage. The essential role of paper in this process has already been touched on (in Background Notes 4). Although very few examples survive, it seems extremely likely that the use of working drawings (and the inevitable appearance of pattern books and design folios), led to the creation of a design ‘currency’ among skilled artisans which enabled the continuous refinement of patterns, and their exchanges between mediums. Pattern in Islamic Art (patterninislamicart.com) offers a FREE download of over 4000 images of patterns and other design features drawn from the rich cultural heritage of the Islamic world.